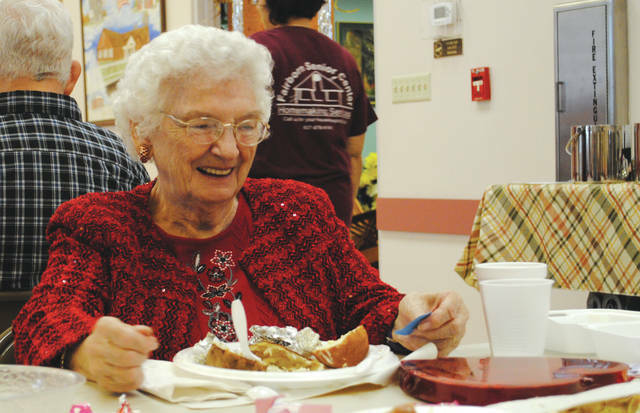 Whitney Vickers | Greene County News The Fairborn Senior Center hosted a special lunch Feb. 15 in the spirit of Valentine’s Day. Menu items highlighted surf and turf options, complete with steak, shrimp, salad, bread, a baked potato and strawberry shortcake for dessert. Members participated in a raffle drawing and had the opportunity to win a number of Valentine’s Day treats. The Fairborn Senior Center will host a chili cook-off 6-8 p.m. Friday, Feb. 16. It will feature nine competitors and five local “celebrity” judges and costs $5 for admission. Tickets can be purchased at the door. 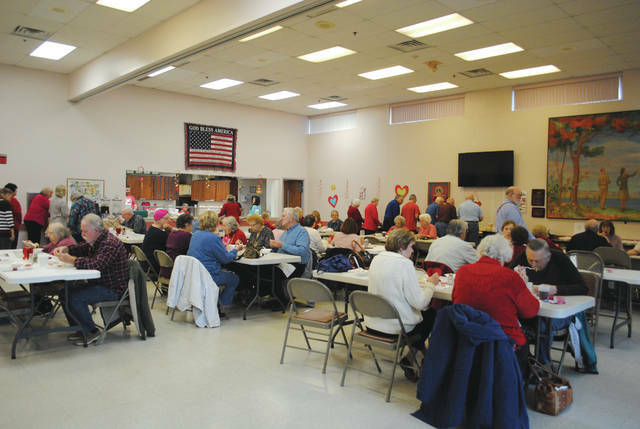 The Fairborn Senior Center hosted a special lunch Feb. 15 in the spirit of Valentine’s Day. Menu items highlighted surf and turf options, complete with steak, shrimp, salad, bread, a baked potato and strawberry shortcake for dessert. https://www.fairborndailyherald.com/wp-content/uploads/sites/50/2018/02/web1_seniorvalentines3.jpgWhitney Vickers | Greene County News The Fairborn Senior Center hosted a special lunch Feb. 15 in the spirit of Valentine’s Day. Menu items highlighted surf and turf options, complete with steak, shrimp, salad, bread, a baked potato and strawberry shortcake for dessert. https://www.fairborndailyherald.com/wp-content/uploads/sites/50/2018/02/web1_seniorvalentines1.jpgMembers participated in a raffle drawing and had the opportunity to win a number of Valentine’s Day treats. The Fairborn Senior Center will host a chili cook-off 6-8 p.m. Friday, Feb. 16. It will feature nine competitors and five local “celebrity” judges and costs $5 for admission. Tickets can be purchased at the door. https://www.fairborndailyherald.com/wp-content/uploads/sites/50/2018/02/web1_seniorvalentines2.jpgWhitney Vickers | Greene County News The Fairborn Senior Center hosted a special lunch Feb. 15 in the spirit of Valentine’s Day. Menu items highlighted surf and turf options, complete with steak, shrimp, salad, bread, a baked potato and strawberry shortcake for dessert.